Do you have your membership card? Check your account balance, reward status, reward redemption, and much more! Check our extended list of available rewards and incentive programs. EXCLUSIVE REWARD CARD : GET YOURS TODAY! 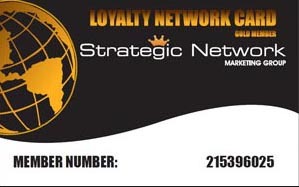 Advertise the right way with Strategic Network and get customers like never before. Strategic Marketing reward programs deliver customers at a whole new level. Don't waste time, money and effort on marketing strategies that will only give you headaches... And no results! Advertise your business the right way! Pay only when you get results!